DUPONT — Over the course of two days last week, 20 corrections officers ran obstacle courses, assembled and fired weapons at targets, and even had to lug teammates more than a mile uphill. It was all part of a competition held at McNeil Island by the Washington Department of Corrections (DOC). The event was held to increase the readiness of DOC’s Special Emergency Response Teams (SERT), stationed at six prisons throughout the state. The use of standardized protective equipment, weapons, munitions, communication, and tactics were measured during the competition. The event concluded with an award ceremony on Friday in DuPont. One of the major goals accomplished through this effort was reinforcing overall team readiness, which is one of the agency’s Operating Processes (OP 5 .b) that DOC tracks and measures as part of Results DOC. The winning team carries home a large trophy inscribed with their names. In addition, their facility gets to send six SERT members to a national competition to represent DOC. 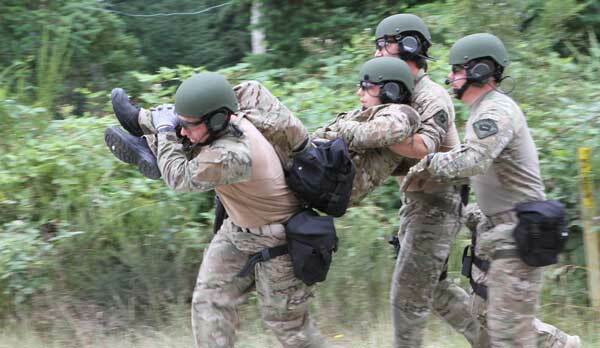 SERT’s primary focus is preparing for hostage rescues at facilities, although the teams are also responsible for transporting high-risk prisoners and taking the lead in regaining control of facilities if needed. The rodeo competition included a hostage rescue scenario. A four-member team from the Washington State Penitentiary won this year’s competition. The team members are Juan Betancourt, Morgan Bradley, Eric Armes and Thomas Vicari. The men said the hardest part was waiting their turn while other teams went through the various courses out of sight.